The past weeks we’ve had no Perl 6 weekly. Trying to catch up with so many things happening on-line and IRL is quite a lot of work and prone to omissions. Please bear with us while we get things on track again. Patrick Michaud has started a new version of the List And Iteration Synopsis. If you want to keep abreast with the developments there, please check it out. If you have any comments, let them be heard now rather than later! Rob Hoelz made the Salt Lake release happen, which came in at 200+ commits. Since then we have seen about 40 commits for the next release, mostly consisting of bug fixes, performance enhancements and the odd new deprecation. This should make MoarVM build on all Debian platforms except Hurd. As of 23 June, Rakudo on MoarVM supports Unicode 8.0, only about a week after its release! 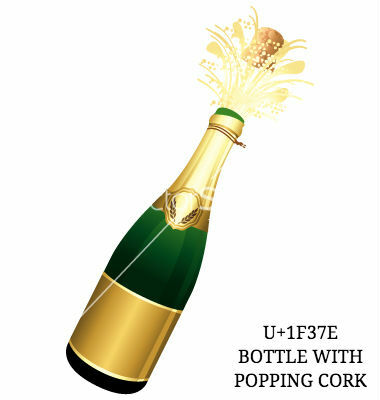 Appropriately for the Perl 6 Party, it has a code point for Bottle With Popping Cork! The target reader of (the first part of) the article is every Perl 6 programmer, which is why all the above is explained by examples of Perl 6 code (no formula, theory, theorem, or property whatsoever) and I tried to do my best to make the article completely self-contained…. The second part of the paper targets language implementers and designers. I haven’t really gotten around to reading it thoroughly, but I find it very interesting that all examples in this article are using Perl 6! Giuseppe is welcoming comments on the per6-language mailing list. Perhaps this Perl 6 Weekly was a bit too sparse on events on the #perl6 channel. Trying to catch up with 3 weeks of backlog has become such a daunting task, that I have only scanned the first week of June for interesting bits (so far). If there are any other interesting bits in the backlog in weeks 24/25, I will mention them in the weekly of week 26. ← If you happen to be in Karlsruhe this weekend, find me at the GPN15! thank you very much, lizmat, for doing this post for me!